I rested my elbows on my mother's knees and gazed up at the strange men. They moved in and out of our small apartment, their heads and shoulders covered by striped shawls. Standing closely together, they swayed and chanted in rhythmic voices. It was the first time that I had seen him cry. I would not see him cry again until his mother died twenty years later. To me, my father was a broad, fiercely strong, dominant man. His grief was contained, but he cried. "What happened?" I asked my mother. I knew something had happened. These men were not like my relatives. These men spoke English, not Yiddish. My family had black numbers etched into their soft forearms. I looked at my mother. She had dark hair and olive skin. She would begin graying shortly. I didn't know that nine years earlier she had been a prisoner in a death camp. "One more week," she later told me, "I would no longer have lived." I did not know what she was thinking. childish manner, I had once said "Sometimes, I think that you are in a club against me!" I wasn't sure what I meant. The days came to an end. My father shaved the beard that had grown on his solemn face. Williamsburg, Brooklyn was a slum. 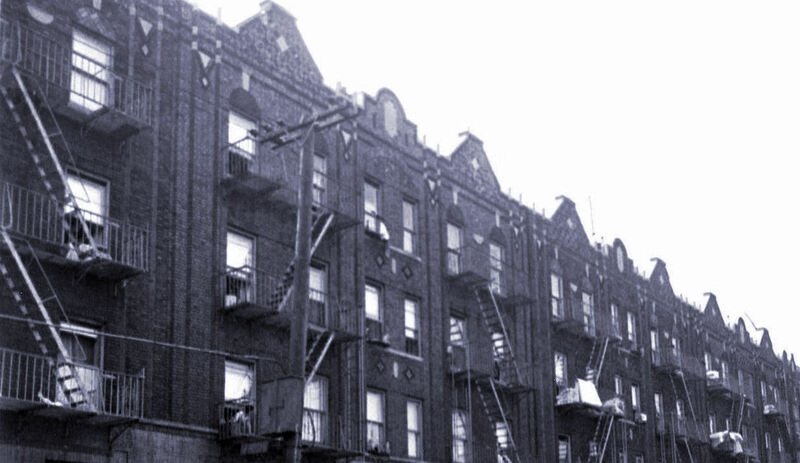 We lived in a five-story tenement owned by The Byliss, an elderly Jewish woman. dishes. He had a fiery temper. He would take things out of my mother's hands and scream "Do me a favor. needed could be found for pennies. The Byliss was immune to De Alte Yanish's curses. When she entered his store, he stayed behind the counter. a chair next to the cool granite stoop in front of the tenement, guarding her domain. "She looks like Shirley Temple!" she told my mother, pointing at me. "Vere ist Shirley Temple?" my mother asked. The Byliss collected our rent. Laboriously, The Byliss would fill out a receipt in her book, tear it out and hand it to my mother. Our apartment had a long, dark hallway. games with their young daughter. Once, I peered inside their apartment through the open front door. A rope swing was attached to the ceiling of the hallway! A swing was an outside thing, yet here it was in their apartment! It was not something my mother would do. The hallway in our apartment extended into the kitchen. the kitchen was the bathroom, living room and my parents' bedroom. escape affixed to the outside of the building. cement, the backs of other tenements, the litter, the tiny sky and think of distant things. balls and hide them in my pockets. In the bathroom, an overhead tank was suspended from the ceiling. I would pull the metal chain to hear the roar of the rushing water. The medicine cabinet had strange things. I once took my mother's lipstick and smeared red drawings on the yellow bathroom walls. "A Dollar Ninety-Eight Hazel Bishop lipstick!" she said. But she didn't punish me. Holes in the wall plaster were visible above the kitchen table. I would pick at the cavities as we ate, enlarging them. An occasional mouse would run across the floor, amusing my sister and I. Our bedroom window faced a brick wall. After we left our cribs, we shared a bed. We fought, but every night I would call "Esther!" "Nothing," I would respond and then I would be able to fall asleep. My father worked many hours. nearby garage. He soon bought another truck. would prepare and then turn to us. I would sit on his lap as he sang a song calling me his little kitten. He sang in Yiddish, the language of lullabies. Sundays, we would go to the corner restaurant. Rising steam fogged the already darkened, navy-blue glass windows. Embossed tin tiles covered the ceiling. The smells of the wurst, pastrami and salami were overwhelming. its double row of covered buttons off the hook and turn to leave. "Tatteh," I said, as if in slow motion. "Look!" He approached her and returned with the coat. "Effsuh she need it for ehre eigenh kindt," my mother said. Red flowers in clay pots lined the entranceway to the Italian barber's shop. A woman who lived on the first floor of our tenement was often in the shop. The adults spoke of her in low tones and pursed their lips. She had long, wavy brown hair and wore tight clothes. She had one son and no husband. The son was "wild" it was said. Once, at the barber's she insisted that I eat flat, lime colored beans that he had cooked. She watched me with a grin. The beans swam in a bitter, golden oil unlike anything my mother had ever made. I wondered if they were poisoned. Later, when I told my mother about the foreign beans, she was unhappy. There was a stable near our building. A single horse lived in the recesses of the structure. The animal fought with the heavily hooded automobiles for space on the cobblestone streets. The cars won and the horse disappeared. My mother sewed our clothes. She made us flowered dirndl skirts with suspenders. Misplaced Heidis, we marched along the crumbling streets of Williamsburg. Another time, she constructed red-dotted white organza dresses. They itched like mad but I loved them. We wore white cotton net gloves, white socks and tee-strapped white shoes. She took us to the photographer. He insisted on putting red lipstick on my pale sister and myself. I smiled at the camera, arms to my side, feet parallel. aunt for my sixth birthday. "I shouldn't have listened to him with the lipstick!" my mother said whenever she saw the photograph. My parents purchased many copies and sent them everywhere, including Israel. Years later, I found one on my grandmother's bureau. Photographs of other grandchildren were pressed under a glass table top. I watched her read from a prayer book as she sat by her window overlooking the Carmel Mountains in Haifa. Esther and I stood apart from the others. Perfectly safe, clean and immortal. When I had children, I send many photographs of them to my parents. "You with your pictures!" my mother protested. had died during the war. Sometimes people would ask my mother questions about the war. It was as if she had not heard them. other side of the street. Even though it was said that he was Jewish. We attended a nearby shul. The women sat in the balcony. arms outstretched and shout in a terrifying voice, unlike his own. Other men stood beside him, hidden beneath their own shawls, joining their voices with his. The people turned their faces away from the stage. I hung onto to the brass railing, cold against my flushed cheek. We played in a public park. Spanish-speaking people began to move into Williamsburg. "Mira! Mira!" the mothers screamed at their children . The young men wore white undershirts exposing their arms and necks. and turned up upside down and placed him in a wire garbage can. The other men whistled and clapped. but I was afraid to go too high lest I overshoot the frame and fall. Our building had a superintendent. My mother would pay one of his daughters to walk us to kindergarten and first grade a few blocks away. One winter, Charlie's family had a giant tree in their apartment. It was decorated with shiny red and silver balls. The tree seemed to go on and on. They would have more children. One day, my father bought a television set. My heart leapt when Roy came through the swinging bar room doors. There were three television stations. Alone and bored, I once forced the dial in the opposite direction to seek additional channels. I reasoned that if there were three channels in one direction, there must be more in the other direction. I loved the toys, the other children, the music and the games. "This is the dolly I love the best. This is the dolly I love to dress. Here she is in her white gown dress. This is the dolly I love the best." My mother sat with the other mothers. I didn't know if she understood all the words. It was the first time she had been in the class. The sun streamed in through the tall, schoolroom windows. After the show, the teacher took the doll away. Its body continued to weigh heavily on my chubby arms. I thought it had been mine to keep. A Catholic orphanage stood across the street. It was surrounded by a high, brick wall. We refused to acknowledge her. As we were fair haired and she was black haired, for a moment it seemed as if the nuns believed us. Hysterically, she managed to pull us back home. Another time, as my mother busied herself with yet another task, Esther and I decided to play hide and seek. shouted weakly, regretting what we had done. It took a long time for my mother to compose herself. One summer day, my father drove his truck to our tenement. Men came and carried away our clothing. I stood beside my father in the cab of the truck. Looking over his shoulder at the swiftly passing streets, I thought, "Now my life will change forever." Elaine Rosenberg Miller is an attorney living in West Palm Beach, FL. Her work has appeared in The Forward, jewishmag.com and Women In Judaism: A Multidisciplinary Journal (University of Toronto).